Blancpain Press Release, February 2009 – At Blancpain, the annual lovers’ day is a celebration. Each year, the Manufacture in Le Brassus makes it a point of honour to conceive and create a limited series of ladies’ timepieces dedicated to love. Watchmaking tradition mingles with the boundless creativity of the brand’s designers, who are never at a loss for inspiration when it comes to sublimating the feminine and romantic spirit of slender mechanical timepieces. The 2009 edition is a special treat for women with a taste for sporty-looking watches. The Manufacture in Le Brassus offers a modern horological interpretation of romance: an exclusive edition of 99 Flyback Chronographs, a timeless gift beating to the rhythm of tender hearts. Valentine’s Day is a powerful symbol and an inexhaustible source of inspiration for Blancpain. In its honour, the Manufacture in Le Brassus presents an exclusive edition of the Flyback Chronograph, combining a daring design with the elegance of mother-of-pearl and rubies. In a tip of the hat to the brand’s pioneering approach to women’s timepieces, the prestigious movement counting off the hours of love is the famous Calibre F185, which powered the world’s very first ladies’ flyback chronograph in 1998! Modern and feminine to the tips of its hands, the Blancpain Women “Saint-Valentin 2009” reveals a graceful, playful spirit. The 34 mm case is happily wed to a white mother-of-pearl dial adorned with a precious ruby heart. The Arabic hour-markers and contemporary-style hollowed cone-shaped hands provide an exquisite counterfoil for the traditional colour of passion, reflected by rubies and the symbolic date of the 14th – the only one appearing in crimson red. 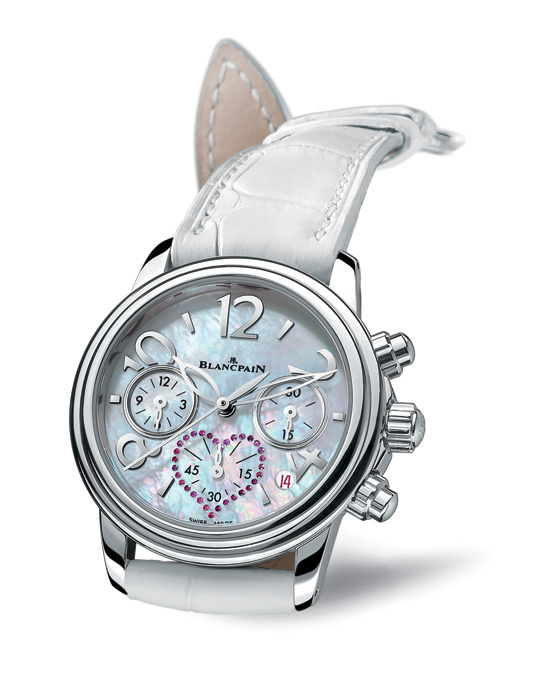 The Blancpain Women “Saint-Valentin 2009” reveals its inner beauty with striking simplicity. It houses Calibre F185 which drives the chronograph functions, the hours, minutes and small seconds, as well as the date display. This complex mechanism features silky-smooth handling via the chronograph push pieces, such as can only be offered by a column-wheel system– the exclusive signature of Haute Horlogerie chronographs. Through the sapphire crystal case-back, the lucky lady who owns this watch can admire the meticulous finishing and hand-crafted decoration, characteristic of that lavished on all Blancpain movements in harmony with the noblest traditions of watchmaking excellence. Issued in a limited edition of 99, the Blancpain Women “Saint-Valentin 2009” is fitted with a hand-sewn white alligator leather strap complete with a folding clasp.